Donkey Kong 64, often abbreviated DK 64, is a 3D platformer video game developed by Rare for the Nintendo 64. It was published by Nintendo and first released on October 31, 1999. The game requires the use of the Expansion Pak in order to function, and was the first Nintendo 64 game to do so. The initial release of Donkey Kong 64 included the Expansion Pak with the game for free. Donkey Kong 64 would later become a Nintendo 64 Player's Choice. The game is a follow up to the Donkey Kong Country trilogy on the Super Nintendo Entertainment System. Donkey Kong 64's inclusion in the Donkey Kong Country series is not immediately clear. 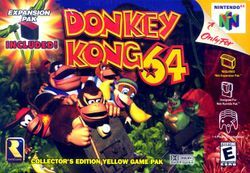 Though the game's codename was Donkey Kong Country 64 in PAL territories, the official title was not branded with this. The only connection to Donkey Kong Country are through the characters: Donkey Kong, Diddy Kong, and Cranky Kong. New characters were also added to this game, whose lore states that they are relatives of characters from previous Donkey Kong Country games (e.g. Chunky Kong is Kiddy Kong's older brother, and Tiny Kong is Dixie Kong's younger sister). This page was last edited on 26 August 2016, at 21:16. This page has been accessed 50,320 times.